The Rosetta Project is pleased to announce the Parallel Speech Corpus Project, a year-long volunteer-based effort to collect parallel recordings in languages representing at least 95% of the world’s speakers. The resulting corpus will include audio recordings in hundreds of languages of the same set of texts, each accompanied by a transcription. This will provide a platform for creating new educational and preservation-oriented tools as well as technologies that may one day allow artificial systems to comprehend, translate, and generate them. Huge text and speech corpora of varying degrees of structure already exist for many of the most widely spoken languages in the world—English is probably the most extensively documented, followed by other majority languages like Russian, Spanish, and Portuguese. Given some degree of access to these corpora (though many are not publicly accessible), research, education and preservation efforts in the ten languages which represent 50% of the world’s speakers (Mandarin, Spanish, English, Hindi, Urdu, Arabic, Bengali, Portuguese, Russian and Japanese) can be relatively well-resourced. 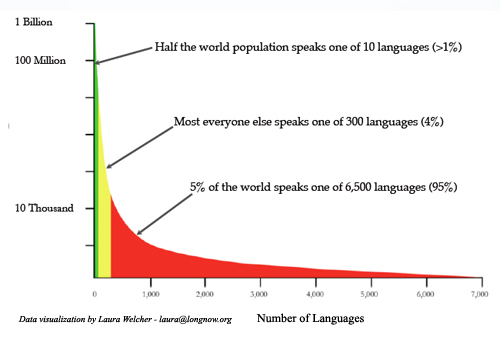 Equal documentation of all the world’s languages is an enormous challenge, especially in light of the tremendous quantity and diversity represented by the long tail. The Parallel Speech Corpus Project will take a first step toward universal documentation of all human languages, with the goal of providing documentation of the top 300 and providing a model that can then be extended out to the long tail. Eventually, researchers, educators and engineers alike should have access to every living human language, creating new opportunities for expanding knowledge and technology alike and helping to preserve our threatened diversity. This project is made possible through the support and sponsorship of speech technology expert James Baker and will be developed in partnership with his ALLOW initiative. We will be putting out a call for volunteers soon. In the meantime, please contact rosetta@longnow.org with questions or suggestions.